Take a look to an aviation museum that is definitely worth a visit for pilots and non pilots alike. 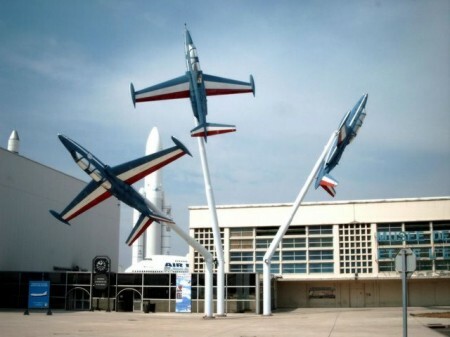 The oldest such museum in the world is located on the Le Bourget airport, just north of Paris, France. The airport is probably best known for its bi-annual air show and airfare, and in normal operations can be seen as Paris’ business aviation airport. The museum was founded just after the First World War in 1918, only 15 years after the Wright brothers’ first powered flight! Let’s first start with some minor negative points: The different aircraft are not as beautifully exhibited as in the Smithsonian air and space museum since the construction of the exhibition hall has quite a lot of pillars, and lighting is not what it could be. Secondly, visitors who don’t understand French do not get the full explanation of all the aircraft on display since this is only available in French. The most important displays are shown with explanations in two languages, but not all. However, the airplanes speak for themselves. This is especially so in the main hall where many very well preserved planes from the early years of aviation hang from the ceiling, or occupy the floor. There are many originals from the early days of flight - from an original glider of 1879 to aircraft of the First World War. 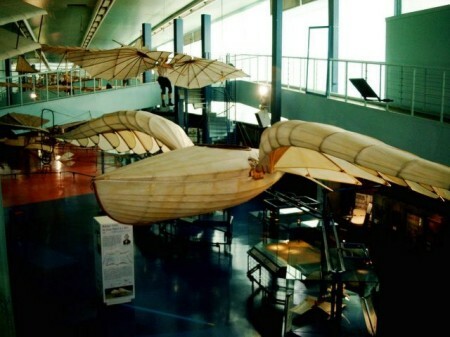 In the early days of aviation people tried to mimic birds for the form of the wings and boats for the hull. The “plane” shown here actually flew, but only as a kite. In the background a replica of a Lilienthal glider. Considering the founding date of the museum in 1918 this is not remarkable, and as a pilot it is amazing to consider how these flimsy machines ever took to the sky. Mechanics will also ask this question, but then rather because the beautiful copper three or four cylinder engines only turn out a fraction of the power that modern planes have at their disposal. 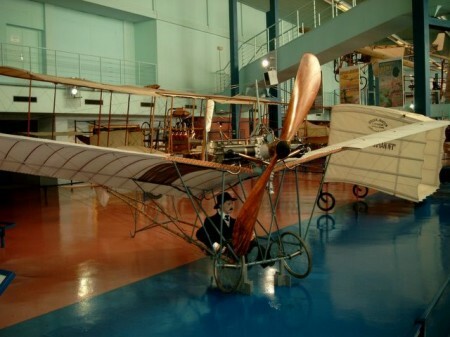 1908 “Demoiselle” de Santos Dumont. The dark area under the wing is the copper-tube radiator for the 25 hp water-cooled engine. Also the first seaplane can be seen here. Of special note is the placement of the engine as a “pusher” all the way at the back of the plane. This was needed because it allowed a mechanic to start the engine from a boat without being sucked or drifted into the propeller! An uglier side of the use of planes is on display towards the end of the main hall. World War I was the first conflict in which planes where used as one of the elements of warfare. First only observations were done from planes with pilots that were ‘gentlemen’ enough not to shoot to each other. Later in the war hand weapons were used, then on-board artillery. With the use of the synchronization between engine and machine gun invented by Fokker, the pilot could fire through the prop and real dogfights could take place. Also on display are some “darts” that the French invented to attack ground forces. Since this wasn’t very effective (actually the German perfected the design, and used it against allied forces) bombs appeared on the scene and with this, bombers like the Caudron G.4. WW I bomber Caudron G.4 (1915). The two 80 horse power engines propelled the plane at a speed of 130 kms/hr, or 70 knots. 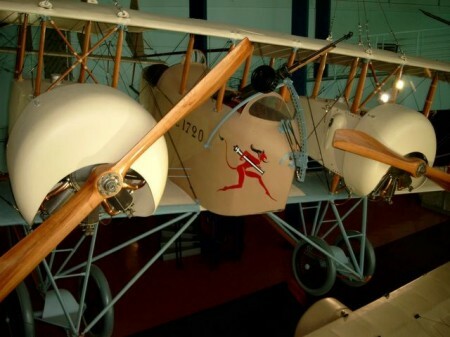 In 1919 a plane of this type flew almost 5500 miles from Paris to Rangoon is 24 stages. From the very early days of aviation to the latest technology is only a matter of some 200 meters. Outside are a replica of an Ariane 5 rocket, a Concorde and a Boeing 747 on display. A second Concorde, actually the first prototype, resides a bit further in a special hall. It can be visited, and still has some of the original testing equipment inside. The more recent specimen outside is on static display only. Personally I feel that this is the most beautiful passenger airplane ever build, and looking at it up close and personal really make you appreciate even more its delicate lines. 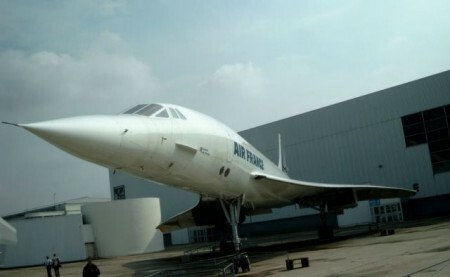 Fortunately the remaining Concordes are donated to museums all over the world instead of scrapped so that people don’t have to travel to Paris to see it after they are decommissioned. Also open for visitors is the first Boeing 747 that Air France had in service. Interesting is that the inside is cut open so that you can see inside the cargo hold, landing gear wells, fuel and water tanks, but unfortunately there is an additional entrance to be paid that I felt was not really worth it. Also on static display outside and scattered around different halls of the museum there are off course the obligatory displays of Spitfire, T6, Hurricane, Fokke-Wulf, and other second WW II and postwar airplanes and early jets that you can find in any aviation museum worth this name. If you continue with the tour, the “Hall of Prototypes” is next up. 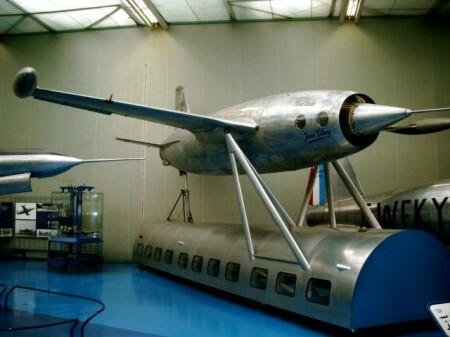 Also here are some post-war flying machines of which you wonder if and how they ever flew. Development on the Leduc started already in 1936, but was stopped because of the German occupation of France. It finally flew in 1947. Now it is one of the many weird machines in the prototype hall. Less interesting to me was the hall of planes that served in the French military, more interesting again is a hangar dedicated to “sport” aviation from parachuting over gliding and gyroplanes to sport aircraft we all like to get our $100 dollar hamburgers in. A visit to a hall dedicated to space exploration rounds up the visit. It is interesting, but people that are mainly interested in this will still feel the need for more.